I was doing some research on Deborah who was the lady who was a prophetess and judge way back before the Israelites had kings. I actually wanted to see if I could find out anything about her husband. The poor man only gets mentioned once. I suppose the mere fact that he is mentioned in the Bible already puts him into a hall of fame. How many people who lived more than 3000 years ago are actually still remembered today? His name is Lapidoth which means flame. There isn’t much written about him on any of the websites and commentaries I looked at but I found something very intersting about Deborah. In Judges 5 she and Barak sing a victory song. In verse 7 she praises herself by saying that village life had ceased until she arose. In the one commentary which was written by Jewish Rabbi’s they speculate that because of the pride she showed by praising herself, God took away the spirit of prophecy from her. Now if that was the case I am very, very glad we don’t live in the time of the Old Testament. Those were tough times. Deborah sat under a palm tree and was the judge. People came from all over the place so that she could sort out their problems for them. Barak refused to lead the army to war if she didn’t go with him. What kind of a wimp was he? So Deborah goes to war with him but she tells him that because he needs a woman to hold his hand, so to speak, his enemy will be “sold into the hand of a woman.” And that’s how it happens, almost like the twist in a soap opera, Sisera flees, Jael tricks him into having a rest in her tent, and drives a tent peg through his temple! The stories told in Judges are hair raising and better than a lot of action movies I’ve watched. Coming back to Deborah, I would have thought that she had something to boast about and was perfectly justified in saying what she said. Maybe being justified is not what its all about, and we love justifying ourselves. We love giving reasons for our actions and making it allright to have done something even when it really wasn’t allright at all. Pride is the root of a lot of trouble today. We are to proud to admit when we make a mistake; we don’t want people to think that we are less than perfect so we pretend. We would rather live fake lives and smile fake smiles than admit we are less than perfect and perfectly human. When people actually do say they have a problem it also gets blown totaly out of proportion by putting outrageous post on social media. Let us not fall into the trap that Deborah fell into and try to praise ourselves and make us look better than we really are. Let us talk less and listen more, let us make time for each other, let us stop and chat and not always be in such a hurry. Let us try to put the needs of others before our own. Let us try to make the world a litlle bit better by not being too proud to ask for help and not too busy to offer a helping hand to someone in need. Let us use the time that we have been granted here on earth to make it a better place and who knows, maybe 3000 years from now someone will know your name. I decided to buy the keyboard anyway because although I’m 50-something and I don’t hide my grey hair, I don’t think I’m completely clueless when it comes to technology. Well, as it turns out I’m using the bluettooth keyboard (with my phone) to type right now and I didn’t need to ask a teenager to set it up for me. Why do younger people automaticlly think that when you reach a certain age you loose your mind and any ability to use technology? I do realise that a lot of young people do know more than I do, and I respect that knowledge. I also hope that in their quest to learn about new things they will not neglect learning about old things too. I always thought that History was the most boring school subject. I know that it had a lot to do with the lack of enthusiasm on the part of the teacher. I recently read the book ‘Assegaai’ by Wilbur Smith and suddenly I had a revelation about people and their loyalties. This book is historical fiction but a lot of it is historically correct. After the Anglo Boer War the Afrikaners were very upset with England. Their women and children had been kept in concentration camps and a lot of them had lost their lives as a result of disease. When the First World War was imminent most Afrikaners were more than willing to side with Germany – because they hated England and not necessarily because they approved of what Germany stood for. The same thing is happening today. A lot of people vote for political parties based on what happened during the last 20 years and not on what the current situation is. The other book I read is a by Dr Peter Hammond called ‘Sketches from South African History’ which I found absolutely fascinating. To learn more about Dr Hammond and his ministry go to http://www.frontline.org.za. On a lighter note – my apple tree is growing – its so small, I wonder if I could call it a treelet? I wrote about Spinach and Clover a while ago, and how clover wasn’t growing around the spinach, and it wasn’t. My theory was that something in the spinach stopped the clover from growing near them. Well, it rained again and I had a brand new crop of weeds, and my theory is busted! There is clover growing right next to and around the spinach. As I’m watching my nice little theory float out of the window, it seems to me that very often we think we know the answers. We have the proof and we can solve the problems life throws at us. Until our theories as busted and everything we thought was a certain way isn’t anymore. Our very foundations are shaken because things that we took for granted or built our lives around fall apart. It could be because of illness, financial crisis or emotional issues. There is always something that won’t work the way we planned it to. That’s when our faith gets tested. What do we really and truly believe in and stand on. Do we have foundations that are strong enough not to crack? Because human beings are really very fragile we can’t rely on our own strength and intellect to sort out every crisis that’s going to come our way. I believe in God. I believe that He sent his one and only son, Jesus Christ to die for me so that I can have eternal life. I also know that when things go crashing down around me, He will be the one I can rely on. The only one. I am not perfect and I can panic and doubt with the best of them, but when push comes to shove, I know where my faith lies. Anyway, I have killed some weeds (organically) by using a mixture of vinegar, salt and dishwashing liquid. I got someone to dig over the section of ground next to the piece I’ve already planted on. I allowed the weeds to grow and last week I decided they were really flourishing, but they hadn’t produced seed yet. I waited for a warm day and sprayed them quite early. By the middle of the day they had stared to wilt and by the end of the day the leaves were already turning yellow. I removed a strip of weeds from the edge of that patch and dug it over again. I divided it into 6 sections and make little mounds that I planted mealies (maize) on. I’m going to plant beans around them so that they can climb up the mealie stalks and then I’m going to plant squash around them to keep the soil cool and free from weeds. I read that the indigenous people in America did it that way and called them the Three Sisters. So we’ll see if it works in Africa too. I had some very over ripe bananas that I dropped into holes that I dug between the mounds the mealies are planted on. This is where I’m going to plant the squash seeds. The other thing I’m really excited about is the apple seed that germinated. I can envision the beautiful tree full of lovely apples. I also sowed some nasturtium seeds next to my cabbages. Hopefully they are going to attract the bugs that would normally attack the cabbages. Like a decoy. This week I’ll try and get rid of the rest of the weeds and see if I can get some beetroot and carrot seeds sown. Have faith and keep smiling! We’ve just survived a 20 hour power outage at our shop. Something about a cable that was leaking power – please forgive me if this is not possible, the technicalities of electricity are way above me. We didn’t have any load shedding all winter and only occasional supply problems, so we’ve really become very complacent as far as relying on electricity for our everyday needs. The night before last I decided that I wanted to make ice cream. I googled some recipes that looked simple enough and didn’t require an ice cream machine. I already visualised lovely creamy ice cream in multiple flavours. I measured the ingredients, warmed, cooked, beat and froze. The freezing part took longer than I thought but I was ready to give it a final whisk this morning, freeze it and enjoy the final product. Last night at about 9 we were plunged into darkness, and this morning we had to do some deliveries before I could get to my ice cream. Certain products enjoy priority when it comes to the freezers that get to run off our generator. Needless to say my experimantal ice cream was not one of them. By the time I got to it (after the power had been restored) there was a mass of ice in the one bowl and the other two were mush. I had divided it into three flavours. The question is do I try and salvage what is left, do I abandon the whole project, or do I save what I can and start all over again? I think the answer to that all comes down to passion. Am I passionate about making my own ice cream or was it just something that I was curious about? How many times are we busy doing something and we get opposition? The way we react to that opposition proves how serious we were about it in the first place. I think the proof of our commitment doesn’t really have anything to do with what people are going to say when we give up (or don’t) but we need to determine what we feel really strongly about and what we do not. Life is too short to be wasting time on things that we don’t have our hearts in. Is that sentence even grammatically correct? I want to spend my time on things that make my heart beat faster. On things that are worth putting time and effort into. What’s really wonderful is how something that I will get really excited about won’t make the next person even bat an eyelid and vice versa. It’s just so good that every person is so unique and that there are enough passions to fill everyone’s heart. Just like the sun shines on everyone and you can’t ever use up all the rays; no matter how many people are enjoying its warmth. Just as a matter of interest, I planted my apple pips in a tin of vermiculite. My husband dropped a coin into on of those machines where you can win a toy or whatever, and he got this sealed tin called a mini garden. It turned out to contain Morning Glory seeds. I found out that they are really classified as weeds in South Africa and you aren’t allowed to propagate them due to their invasive nature. When I put the apple seeds into the growing medium I thought I had removed all the Morning Glory seeds. Four days after the seeds received their first water. From this picture you can see how fast these plants grow. Within a month they would be mammoth. I pulled them up and destroyed them. They have vigorous tap roots. The other interesting thing I saw today was a paw-paw without any pips. I don’t know whether its a specific cultivar but I’ve never seen one before today. My seedless fruit pawpaw – easy when I made the fruit salad, but really strange. 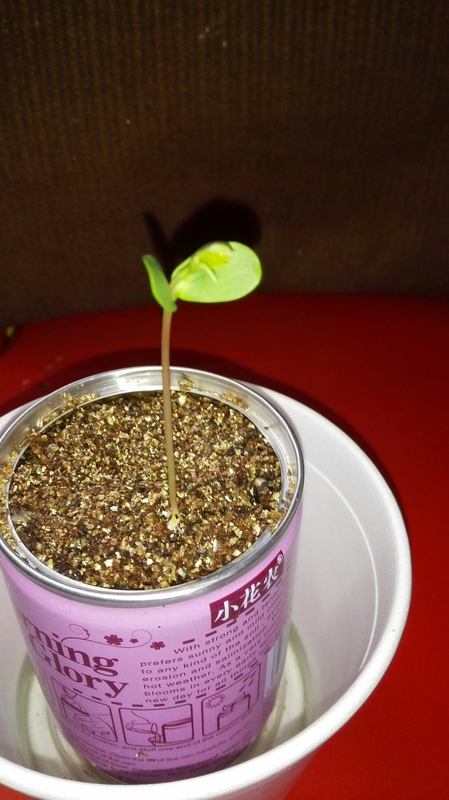 Now my apple seed have the vermiculite all to themselves and I see there’s a little green stem appearing. I can’t wait to see if its really the beginnings of my first apple tree. I hope you are all going to enjoy indulging in your passions.